While couriers J, M and S have been collecting and delivering pets around Europe, courier L has been arranging flights and paperwork for other pets leaving the UK and going further afield, assisted by courier R doing the airport runs. 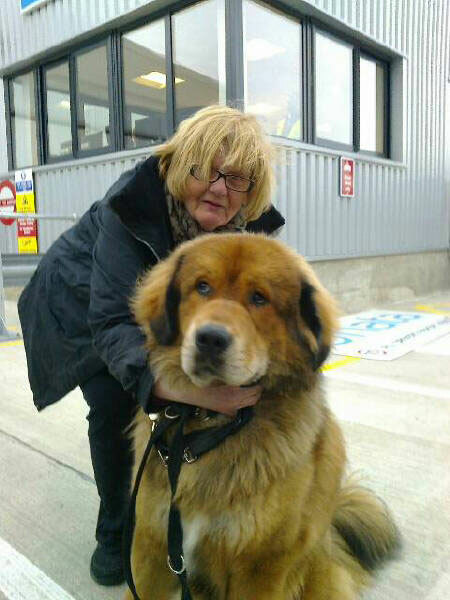 Gorgeous one-year-old Tibetan Mastiff Bono flew to Melbourne in Australia with Qantas. During the preparations for his flight, he lodged with Jenny, who was understandably sad when it was time to say goodbye. However, his new owner Charmaine, who runs the Temzin Tibetan Masiff Kennels, has been counting down the days until his arrival. The wait is almost over, as Bono has to finish his 10 days at Spotswood Quarantine Kennels before he can meet his new family. 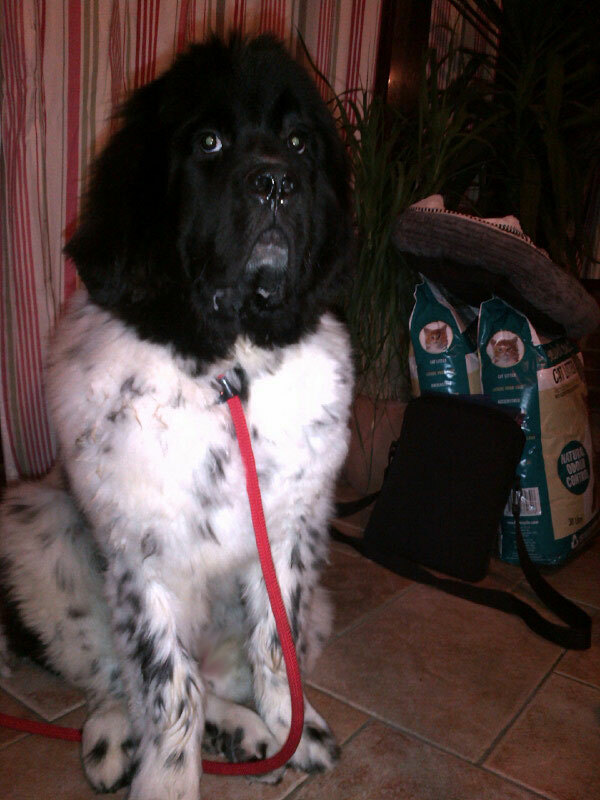 Meanwhile five-month-old Newfoundland puppy Capability flew to Bermuda. Animalcouriers arranged his paperwork and he stayed overnight with courier R who drove him to London Gatwick to check in for his British Airways flight. 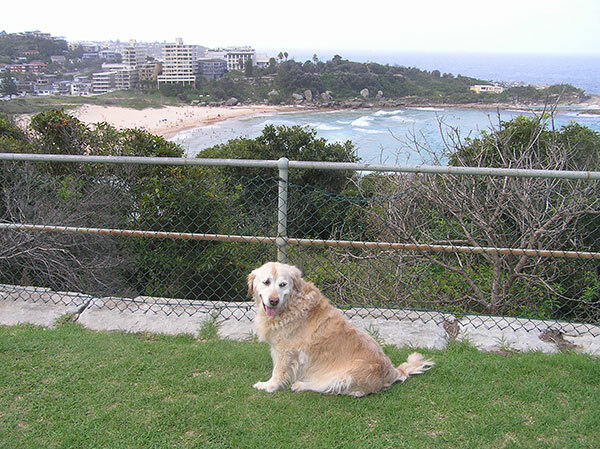 Cassie at home in Sydney — lucky dogs have a beach at the end of the road! Newfoundlands are known for their gentle, laid-back personalities. Capability spent all of five minutes orienting himself, then dropped off to sleep! Bono is beautiful and reminds me of a big fluffy teddy bear. Capability is beautiful and I have never seen a dog like her before. Bono is beautiful and huge – a real softie. Ditto Capability – he’s very laid back too. 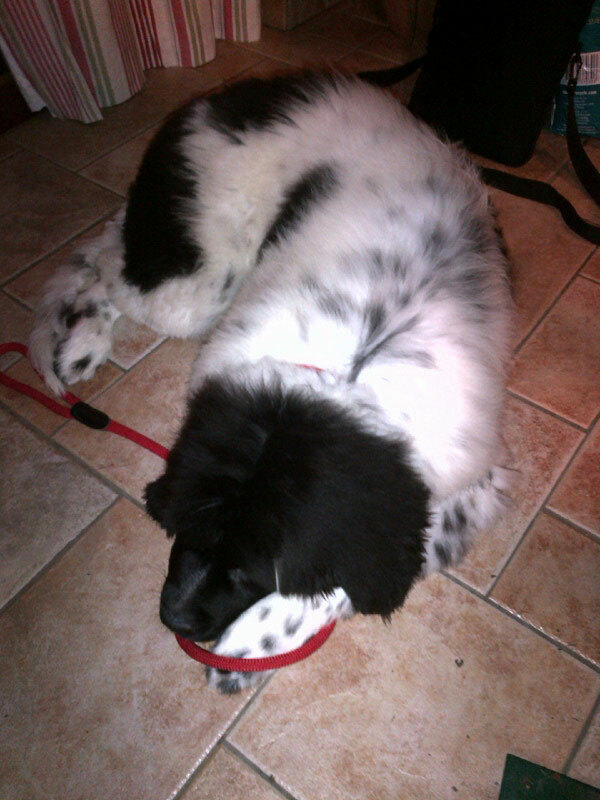 Bono is a HUGE dog! What kind is he? I have never seen a newfie with this coloring. I bet he will be the talk of Bermuda. Capability will certainly turn some heads in Bermuda. Those are some BIG puppers! And they haven’t stopped growing yet! I want Bono! What a beauty. I never saw such a dog like Bono. He is wonderful! I wish they all could come for a stopover to my crib, that would be nice (for me)! What a cute grizzly bear cub…eh, I mean dog? BONO! What a big ball of joy! Oh, he is a BIG ball of joy! Oh my gosh what a gigantic teddy-bear of a dog, no wonder Jenny was sad to see him go! I am not sure that I have ever seen a Tibetan Mastiff before, and am now off to do a google search and learn a bit about those big softies! Wishing you all a wonderful weekend! They can grow to be enormous and we think dear Bono might be at the large end of the TM scale! Hadn’t seen a Tibetan Mastiff before either. What an utterly lovely HUGE ball of fur. Both dogs look so sweet and laid back. I bet they’re a joy to have around. Both are huge softies and their new families are going to adore them. Bono is much more handsome than the human with the same name! I wonder does he look good in wrap-around shades? Bono (the dog) would look good in anything! Bono is FIVE months old. Big adorable boy! All of them are precious. A friend of mine at a TM, and he was tiny – not much bigger than a Lab. Bono looks life-size and so huggable! Well, they can range from 40-82 kgs so your friend’s fellow must have been at the very low end of the scale. He was too small to be shown. His littermates, however, were massive! Hard not to take a good photo of these gorgeous dogs! Wow! It just amazes me what all you guys do! You are wonderful! Ha ha ha – is hubby a little hairy? Wouldn’t you know it, 😀 ha. Awww I just know I would be bestie with them in no time! You’re right Misaki, you’d go down very well with the big boys! Bono and Capability are gorgeous! Cassie looks very sweet, almost like a lapdog compared with the others!